These shoes are totally adorable. 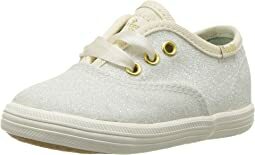 We have ordered many pairs of Keds for my girls in the past, so we already knew that they run narrow. These are no exception. My girls have super narrow feet so that works out perfectly for us! We bought these for matching flower girl shoes and the girls are so excited about their matching "princess shoes." These are gorgeous! They ran a bit narrow but mostly true to size. The Velcro isn’t strong enough. The shoe is even prettier than the picture. I love them ...a true find for the princess in your life. I bought these for a friend and she wears an 8.5 in women's and the size kids 6 fit perfect! She gets tons of compliments on these shoes. They are so pretty! Love these shoes! They go great with just about everything. I got these instead of the adult size because of the glitter size, preferred the small over the large. I wear a 5.5/6 in adult and the 3.5 fit perfectly! The glitter has not fallen off and the satin laces have yet to come undone. Highly recommend for a dressed up casual shoe. I love polka dots AND Keds!! And I bought 2 pair just alike while they were on sale! I will save the second pair for when I wear the first pair out. They go good with pants as well as casual dresses. So I feel that I won all the way around. I bought these adorable shoes for my 10-year-old daughter. She measured for a size 3, but we sent those back and got the size 2. She says they’re still a bit big, but they don’t seem to slip off of her foot. The cats are charming and the shoe has a nice clean cut look to it. Looks great with dressier outfits or jeans, with socks or without. Very satisfied with these darling shoes. these are adorable and have hidden Velcro which is great for tots. My daughter is a 6 and i got these in a 6.5 and we couldn't close the velcro so i'm going to try a whole size bigger. I loves these! My daughter loves them! Just cute and perfect! Love love love these shoes! I am a women’s 5, ordered the 2.5 and they fit perfectly. Love having matching shoes with my daughter. My daughter thinks they’re cute! I like that it comes with two different laces. She can dress these up or wear them casual. She even liked the cute Kate Spade green box they come in! These are perfect. They are glittery and cute, girly perfection. My 7 year old loves them. She wears these often, and they still look great. And she is not easy on shoes. Her feet tend to be narrow, and these do not slip. Cute sneaker that can be worn as a “dress” shoe. It comes with two sets of laces - ribbon laces and standard sneaker laces. Big hit with my 6 year old! These shoes are super cute (and comfortable for narrow feet) BUT after less than a day of light wear, several of the embroidered polka dots have began to fray. I am very disappointed especially since they are special colaboration and cost more than the regular 'Champion' Keds.